Darlings if we learned anything, anything at all, from Audrey Hepburn in Breakfast At Tiffany’s it is that all girls should be in possession of two very important things: a little black dress that drapes decadently over her form, and a singular strand of pearls to clasp around the nape of her neck – two timeless, sophisticated necessities that one is simply powerless without. By now I imagine many of you are already armed with the former; now, however, you have the chance to claim the latter as your very own. You’ve surmised correctly, kitty cats! 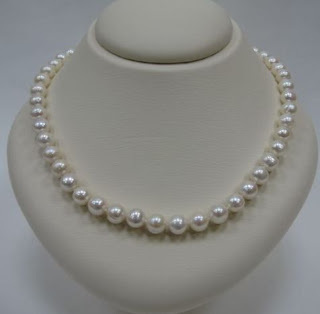 Café Fashionista has teamed up with Louis Anthony, a premiere Pittsburgh Jeweler, to bring one (1) of you fortunate femme fatales a pearl necklace valued at approximately $300.00. A bedazzling bauble made up of 9.5mm freshwater pearls hanging 18-inches in length, and adorned with a 14k gold French hook-style clasp destined to sprinkle your style with a chic touch of classic appeal. ♥For one (1) entry, leave a comment on this post between now and Thursday, January 28, 2010 at midnight PST. ♥For two (2) entries, Twitter about this giveaway, and leave a comment on this post between now and Thursday, January 28, 2010 at midnight PST with your Twitter URL. ♥For three (3) entries, become a follower of Café Fashionista on Blogger/Google Reader/Google Friend Connect, and leave a comment on this post between now and Thursday, January 28, 2010 at midnight PST (if you are already a Café Fashionista follower, please say so in your comment). I will randomly pick one (1) name out of a hat (who knows, it could be yours! ), and announce the winner on Friday, January 29, 2010. Thanks to Pittsburgh Jeweler for the picture. i want that pearl necklace. pearl will always be my best friend. There is nothing more classic of the look that pearls can give an outfit. I am a followerof your blog. This is an amazing giveaway!! I so love pearls. :-) Please enter me. And, I am a follower! Wow what a classic giveaway! I love wearing pearls to work and church. Thank you for the chance to win, meeooooow!!! I am a follower and I will be tweeting about this (SciHousewife). What a great giveaway, I don't own any pearls! how i'd love to win this! it's so pretty. p.s. i'm a follower and i tweeted about this giveaway. What a fantastic giveaway! I'm a follower of your blog. Fabulous pearls... I love 'em. Pearls are my favorite! COunt me in! I'm so excited! I love Breakfast at Tiffany's and these pearls couldn't be more perfect for a cafe reader! What an AMAZING giveaway! Being in a sorority in college pearl necklaces were a staple, though most (including myself) wore fakes! Ooooh and I am a follower! Such a lovely giveaway! Thanks for the chance to enter. Beautiful! Pearls are always so classy! Is it open to Canadian residents as well? Don't hate me darling, but even though I'm a good Texas girl that went to Baylor, I can't do pearls. What a stunning prize, darling! I am so excited about this giveaway! So stunning!! Yes, every girl does need a gorgeous set of pearls. Whoever wins is one lucky (and stylish) lady! what a fun giveaway!! have a great weekend!! Ooh, how exciting. I broke my pearl strand last year and have yet to come up with another! So not fair.....I need pearls too....from entrant living in the Netherlands!!!!!!!!! You know I'm a follower. Great set of Pearls your giving away. I will also tweet this for you :D Have a happy Friday and great wknd! it's such a perfect necklace! Congrats to whichever lucky girl wins it! What an amazing giveaway! I'm stunned by this. I must win!!! you have a very good blog ! I recently re-watched Breakfast at Tiffany's and her black dress, multi strand pearls, highlighted updo, and cat eye liner still gets me every time. This is an absolutely fabulous giveaway! I have been obsessed with pearls for a very long time and I agree, no girl should go without them. Great post! Great giveaway! I'm a follower of your lovely blog. I am most def a follower!!! Cute blog! I love the necklace. What a wonderful necklace, I adore pearls! Oh how I wish I lived in America! Just to have those pearls! Happy 2010! I just stumbled upon your virtual chronicle and absolutely love your world view. If you get a chance, swing by and say hello. I would love to hear about all your wants, musings, and distractions. Thank you darling and wonderful blog, I will be back regularly. Girl - you can't go wrong with a fabulous pearl necklace! Please enter me in! What a fabulous givev-a-way! Im not a US resident but its gorgeous. I have a pearl necklace and matching earing sets! they are a true fashion staple! AMAZING giveaway, omg so excited! Oooooh please, let it be mine! Ahhh, pearls are gorgeous and go with everything - also they look fab on Audrey! Hello darling! I have been away and now I am back! You know I always following! :) Love you! I always love pearl nacklaces!!! Ohh I wish I live in the USA x) Anyway , I've sent you an email . Have u got them ? :D Have a nice weekend dear ! What a lovely lovely giveaway, I would LOVE to win! Cheers! Thanks for adding me to your blog roll, I have added you now too. I know you don't do awards but I can't resist passing on one to you ... you're my daily read! I posted it on my blog a few minutes ago. Have a fantastic weekend! Wow, this is a really beautiful necklace! i can't stress how important it is for a girl to have pearls! my little shop is sadly low on them right now, but fear not! i'll be getting busy making new pieces in the coming weeks! and i do follow you, my dear! Oh, yes, I'd love that! I'd even do a video blog wearing it! What little girl doesn't dream of pearls? I would love to win these! She may not have been fashionable but Julia Child was certainly chic in the kitchen with her pearls. I love pearls, the only jewel one can layer without restraint. Fantastic giveaway. I'm new to your blog, but I think I'll become a daily reader. I love pearls - although I especially love to rock them in unconventional ways, like with a vintage rock tee. What a great giveaway! I definitely follow you on Google Reader! You're one of my favorite daily reads! Already a follower of your FAB blog! Erika, what a beautiful giveaway! Pearls liven up any outfit... even a plain tee and jeans.. throw on some pearls and a pair of heels and viola, instant chic-ness! Audrey Hepburn pretty much made the LBD with pearls! Amazing necklace too! woo! I actually just stumbled upon your blog today when I was searching stuff about over-the-knee boots. Love your site! Added it to my bloglovin :). Great, gorgeous giveaway! =) I'd love to win. I am a follower- Lydia A.
Gorgeous! She really new what fashion was about along with COCO Chanel :) all I have are my fake pearl necklaces :/ whoever wins this just got a great prize! Lovely giveaway darling - we all need our Audrey Hepburn moments! Of course I'll follow you to NYC and back! Oh yes and tweeted from @cncliving. like a good southern girl i do love me some pearls! amazing giveaway and of course i follow you lady! A string of pearls is the classiest piece of jewelry a girl can have. What a fantastic giveaway! Would love to own my first set of real pearls...Audrey Hepburn, here we come! OH and I'm a follower too! Here's hoping! A great pair of pearls has been on my wishlist for a while now! Oh, and I follow you, too! And a tweet to increase my chances! I must have these gorgeous pearls, they will be my first! I also follow you through Reader. I would love love to win these pearls! So beautiful. Oh, is this a stunning necklace! The size of the pearls is huge and look at them shine! I would love to have this! This would be a perfect Valentines Day gift for my wife! She would LOVE it and me! Great giveaway! Thanks for all of the hard work that goes into your lovely blog.